Now, they’re sitting alone at the top of the Hailey Coed Softball League record book. Top-seeded 7 Dog Ranch won its sixth straight Hailey Coed Softball League tournament title through the loser bracket, beating No. 2 seed Cups and Bras 17-7 and 16-8 in the final games Sunday at Lions Park. It was another awesome team hitting effort by 7 Dog Ranch with 40 hits and 33 runs in the two championship games—scoring runs in 11 of their 13 at-bats in the deciders. The champs hit .516 and averaged 18.7 runs in six games. 7 Dog Ranch ended up with a 5-1 tournament record and 112-30 runs against. The champs finished 18-2 this summer and boast a 102-8 win mark in games over six years in league and tournament play. In the final game, 7 Dog Ranch outhit Cups and Bras 24-14 led by a 4-for-4 effort by its leader—pitcher Sean Harrington (5 RBI). He belted a grand slam homer in the sixth inning extending the 7 Dog lead from 12-7 to 16-7 and pretty much sealing the deal for 7 Dog. Harrington was nearly unstoppable at the dish with a .818 average and 14 of his 18 hits for extra bases. With its sixth consecutive Hailey first-place hardware, 7 Dog Ranch surpassed Uhrig Fencing (1995-99) and Wicked Spud (2000-04) for the longest tournament win streaks over the league’s 26 seasons. The winners were deep in talent including the men’s and women’s Most Valuable Players—Joe “Fish” LaManna, the 7 Dog shortstop, and Sharon Payne, the sure-handed first baseman and No. 6 hitter. LaManna excelled in the field and went 4-for-6 with four runs scored from the No. 9 spot in the final two games. Afield, he had five putouts and nine assists over the two title games, many spectacular. Veteran Wood River softball star Payne had 17 putouts without an error in the final two games—often turning infield tosses into outs with long stretches or with unlikely grabs of fast-moving throws. They weren’t alone in the heroics when the champs needed them. 7 Dog Ranch slugger T.J. Petersen (3-for-4) slammed a towering three-run homer that brushed the top of the tallest right field trees in the visitor fifth for a 12-4 lead. Left fielder/No. 4 hitter Anna Edwards went 3-for-4 and second sacker Greg Schreiner (4 RBI) powered a clutch two-run homer for an 8-4 lead in the fourth. Fleet center fielder Kyle Bennett went 4-for-4 in the final and reached base nearly every time—23 hits in 26 at-bats with 18 hits for extra bases. Greg Edwards drove home three. Lacy Harrington and Hannah Gove each had two hits. For Cups (14-4), a runner-up for a second straight year, Casey Hawkes (3 RBI) and Morgan Uhrig each had three hits in the decider. Justin Herald cranked a three-run round-tripper for an early 4-3 lead. Karly Maratea and M.J. Musselman each had two hits. In 7 Dog’s 17-7 first-game triumph, rover Greg Edwards (7 RBI) went 3-for-3 including a pair of three-run HRs as the winners scored runs in each inning to force a second game. Petersen added a two-run homer. Bennett, Schreiner and LaManna each had two hits. Left fielder Musselman and pitcher Matt Nelson each had three hits for Cups (16 hits), who left eight runners on base. Earlier Sunday, Cups and Bras relegated 7 Dog Ranch to the loser bracket 11-10 in eight innings by rallying from a 9-6 deficit with a 5-1 scoring edge in the final four innings. Herald scored the winner after a one-out double in the eighth. Ryan Stavros (5 hits) belted a leadoff HR in the visitor seventh sparking a three-run rally tying the game 10-10 and sending it into extra innings. Herald added three hits, Matt Nelson socked a two-run tater and Uhrig had three hits. 7 Dog came up short in that game despite another 4-for-4 effort by Bennett (3 doubles, triple), two-run homers by Greg Edwards and LaManna, and a Petersen blast. Taking third place was Wicked Spud/Overhead Door with a 3-2 tournament record to finish a 12-7 season. Batting leaders in Spud’s three straight wins after a first-round loss were Jamie Stone (9-for-11, 6 runs), Michael Adamson (9-for-13, 11 runs, 5 HR) and Shawn Huntington (8-for-13, 7 runs, HR, 3 doubles). In another highlight: Tommy Thompson ripped the game-winning walk-off homer in the 15-14 Mahoney’s first-round win over Alternative Color. Saturday’s Home Run Derby, winners were Tammy Dilworth of Mahoney’s Bar 7 Grill with nine and Petersen of 7 Dog Ranch with seven. Pitcher Donavon Romrell served up offerings, with female contestants hitting from second base and the men from home plate. Final results, women: Tammy Dilworth 9, Toni Marcroft 3, Jamie Ulrich 3, Trena Andrus 3, JonMarie Shaw 2, Sarah Nelson 2, Kaylie Pomrenke 2, Sarah Meyers 2 and Josie Dawson 1. Men: T.J. Petersen 7, Michael Adamson 6, Casey Hawkes 4 and Patrick Ballou 1. 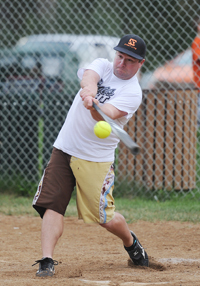 The Hailey Coed Softball League All-Star game is 6 p.m. Wednesday, Aug. 13 at Lions Park with Jeff Jones of Alternative Color Painting and Frank Suwanrit of Sons of Pitches as the opposing managers. Outfield, female: Anna Edwards (7 Dog Ranch), Sarah Nelson (Sons of Pitches), Trena Andrus (All Out) and Ashley Anderson (Alternative Color Painting). Outfield, male: Joe Molyneux and Brandon Ivie (Alternative Color Painting), Greg Edwards (7 Dog Ranch) and Brandon Beall (All Out). Infield, female: Jamie Stone (Wicked Spud/Overhead Door), Kim Romrell (Alternative Color Painting), Tammy Dilworth (Mahoney’s) and JonMarie Shaw (7 Dog Ranch). Infield, male: Jeff Stedman (Alternative Color Painting), Morgan Uhrig (Cups and Bras), Joe LaManna and Kyle Bennett (7 Dog Ranch). Pitchers: Sean Harrington (7 Dog Ranch) and Rich Ulrich (Wicked Spud/Overhead Door). Catchers: Sarah Meyers (Alternative Color Painting) and Jimberly Rooney (All Out). Extra hitters: Jamie Ulrich (Wicked Spud/Overhead Door), Aaron Molyneux (Alternative Color Painting), T.J. Petersen (7 Dog Ranch) and Sean Moore (View Point).